This morning and throughout the day, cloud and rain sagged onto the North Island, dripping moisture onto the landscape and screening hills and lakes. After breakfast in the dry, spacious kitchen of the Motutere Bay Holiday Park, Vilis and I packed up the rented station wagon ‘micro camper,’ balling up the soaked canvas awning and storing it in its bag. Dampness had invaded the vehicle overnight, pervading its air and infiltrating bedding. We drove north on SH 1 to Taupo, completed shopping tasks, and then continued north on SH 5 through a landscape utterly dominated by pasture for dairy herds and by extensive pine plantations with invasive gorse and Scotch broom growing in their understories. The combination of the two stretched as far as the eye could see, creating the impression of an artificial landscape. North of Wai-o-tapu, we noted a tract of native forest growing within the Rainbow Mountain Scenic Reserve and kept it in mind for a future exploration. Today, however, our destination was Whirinaki Forest Park southwest of Te Urewera National Park, where an assortment of shorter tracks would allow us to explore native New Zealand forest without embarking on a backpacking expedition (our backpacking gear was in storage in Auckland). From SH 5, we turned onto SH 38 and angled southeast through a seemingly endless and tedious collage of sheep and dairy grazing land backed by the monotonous deep green of conifer plantations edged with yellow-blooming Scotch broom. It seemed a bizzarre irony that the road was labelled ‘Rainforest Route’ when the only trees to be seen would never have existed in a New Zealand rainforest. Both Vilis and I were saddened by the blatant commercialization of such vast tracts of North Island landscape, as though the land were worth only the dollars it could produce and native ecosystems had no inherent value. Near Minginui, we ate a picnic lunch in a shelter at the Mangamate Waterfall campground and strolled the riverbank beneath the shelter of our umbrellas. 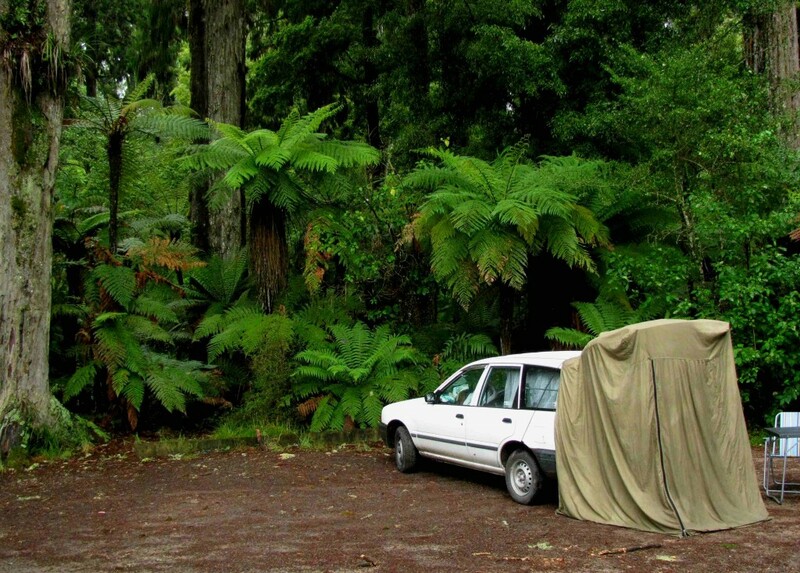 At last, in late afternoon, we reached the richly diverse rainforest of Whirinaki Forest Park, the moss-clad trees a pot of gold at the end of a disheartening highway. 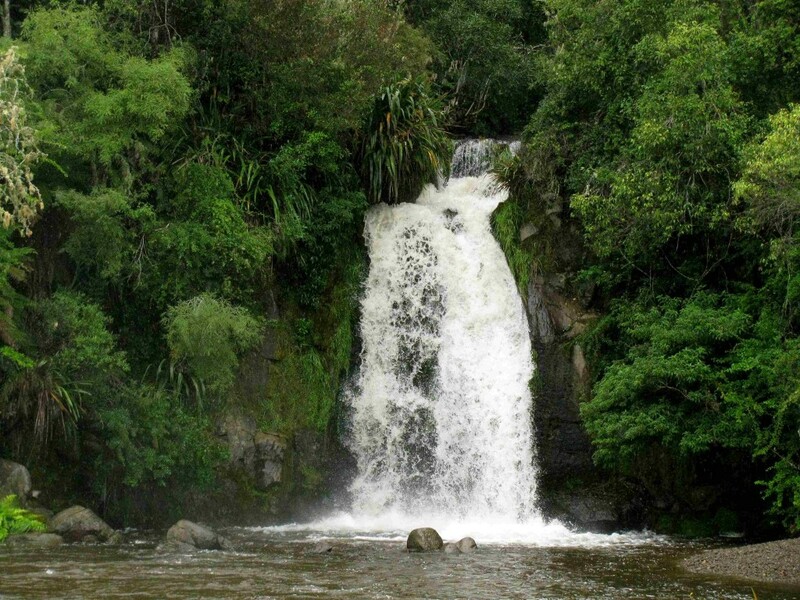 In rain, we tramped the Whirinaki Falls Loop track through forest lush and green and gorgeous. 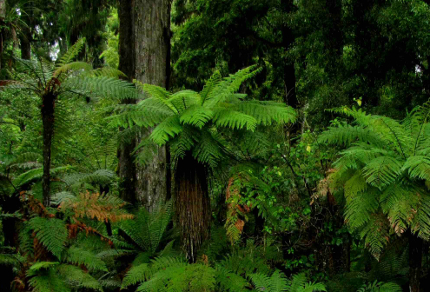 Tree ferns in the rainforest understory tossed brilliantly verdant fronds into the dim light beneath towering trees – slender-leaved tawa, serrated-leaved kāmahi, and the giant podocarps miro, rimu, tōtara, and mataī. We soaked it all up, thinking that this was the real New Zealand, not the enormous dairy farms and pine plantations past which we had driven. 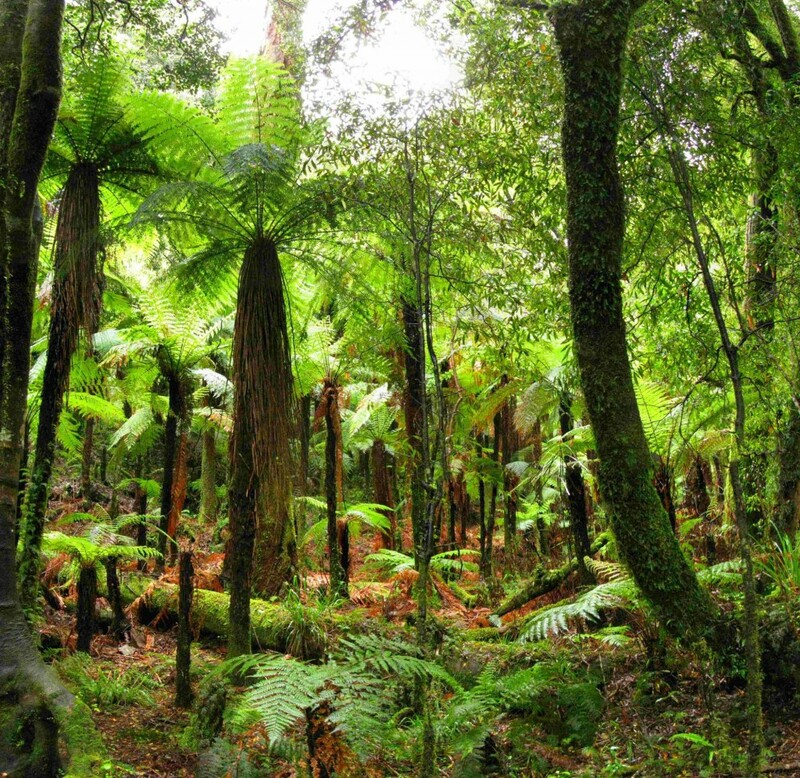 It was this vegetation – which included silver ferns, the symbol of the All Blacks rugby team – that truly embodied the natural character of this country. Following the track which ran parallel to the rushing, green Whirinaki River, crossed it, and returned on the other side, we used our umbrellas to shield us from wet vegetation and rain dripping through the rainforest canopy. We skirted small pools of water in the track and squished through soggy stretches. Sections of the track were narrow, eroded paths on sheer slopes above the river, offering spectacular views into the rainforest, but sometimes slippery surfaces, as Vilis discovered when he lost his footing and came close to falling over the edge. I heard the distinctive ‘fee-o, fee-o‘ whistles of blue ducks, known to the Māori as whio (pronounced ‘fio’), as well as parrotesque calls from the forest. I looked for kaka – large, bronze-coloured forest parrots with red underwings and bellies – but saw none. Hours later, we cooked a hot pasta supper in the trail information shelter and set up the ‘micro camper’ in the carpark. 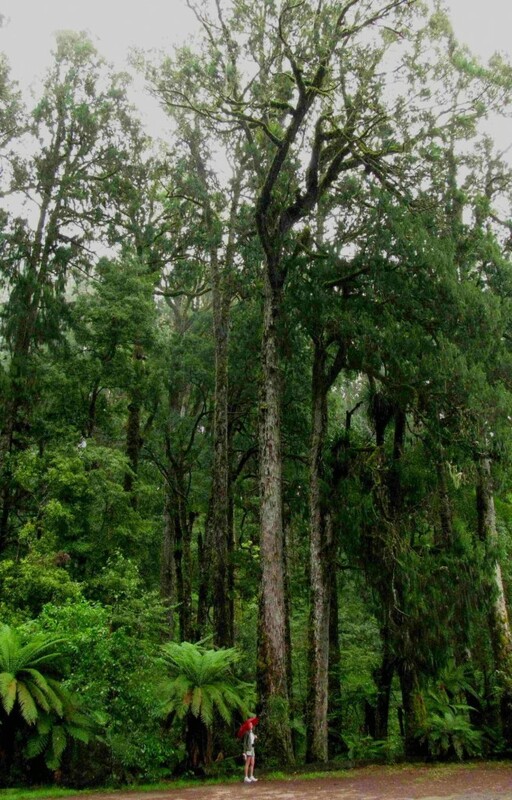 Tomorrow, we would explore the track to Arohaki Lagoon and its kahikatea, the tallest native tree species in New Zealand.